Marsue Williams is a Dallas native, a graduate of North Dallas High School and the University of North Texas in Denton, Texas. After Graduation, she taught school in the Dallas ISD and the Van Alstyne ISD for (12) twelve years before entering real estate. A realtor for over 29 years, she began her career by selling over 40 farms and ranches in Collin and Grayson counties in the late 1970's. She was instrumental in the formation of the McKinney Realtors Association as well as the Downtown McKinney Historic District. Since 1982, Ms. Williams has been involved in the design, co- development, leasing, management and eventual sale of over 800,000 square feet of Commercial/Retail and Multifamily properties in the Dallas/Ft. Worth area. In 1987 and 1988, she was the Number One producer in retail leases closed for Westover Realty, Inc. In 1988 she founded Touchstone Realty Advisors, a residential brokerage company specializing in executive homes in the intown Dallas markets. Since 2004, she has been awarded the achievement level of Pinnacle Producer with Allie Beth Allman & Associates, the most productive level in the company as well as Vice President. 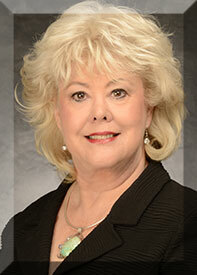 Today, her primary focus is the marketing of executive residential properties in the Dallas area.